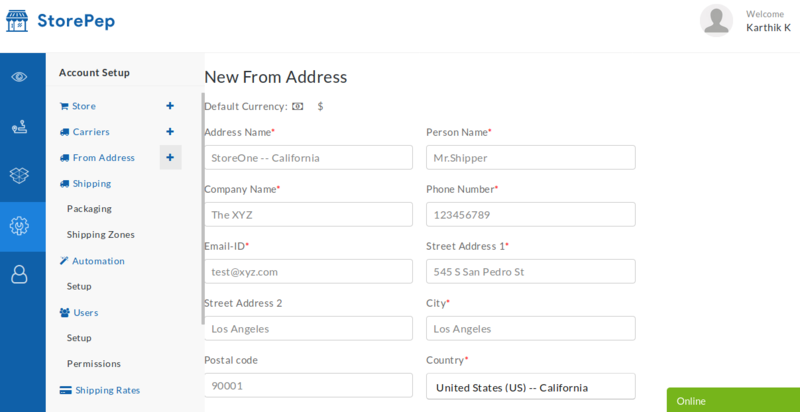 Configuring your ‘Ship From’ and Billing Address are important steps towards kick-starting your e-commerce shipping. The delivery rates that are displayed to the customer are calculated using the ‘Ship From’ address only. To set up this information, go to the ‘Settings’ tab on your StorePep dashboard and click on the ‘+’ sign next to the ‘From Address’ option. Enter the details and click on ‘Add’. You even have the option of uploading an image of your signature. The default currency changes based on the country specified in the ‘Ship From’ address. Enter your address details and click on ‘Add’. Congratulations! You are now one step closer to shipping with StorePep. In case you have any questions, reach out to us using our contact form and our specially trained agents will get back to you within 24 hours.